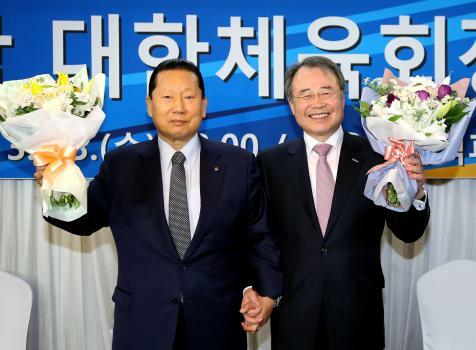 Dr. Kang Young Joong, president of the Korea Council of Sport for All and Kim, Jung-haeng, president of KOC, were inaugurated as co-presidents of newly integrated sports body called Korean Sport & Olympic Committee. Therefore, two co-presidents participated at the inaugural ceremony which was held at Seoul Olympic Parktel, March 23rd. Dr. Kang and President Kim will serve as co-presidents until the end of October, when the election for the new president will take place. Both co-presidents emphasized that the integration must serve as a momentum to make advanced sports system.